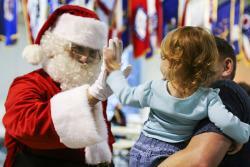 Wondering where you can meet Santa in Wichita this holiday season? There are lots of fun places to visit Kris Kringle, and you can even arrange to have a meal with jolly Saint Nick. 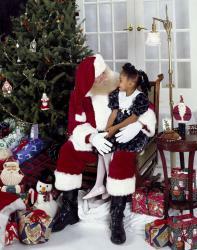 Nov. 9-Dec. 24 - Towne East Square offers photos with Santa daily through Dec. 24 in the lower-level center court. Special events include pet photos on Dec. 2, Caring Santa on Dec. 9 and story time with Santa on Dec. 15. Make sure you reserve a spot in line. Nov. 11-Dec. 24 - Get a free printed photo with Santa inside Cabela’s during the daily Santa’s Wonderland. 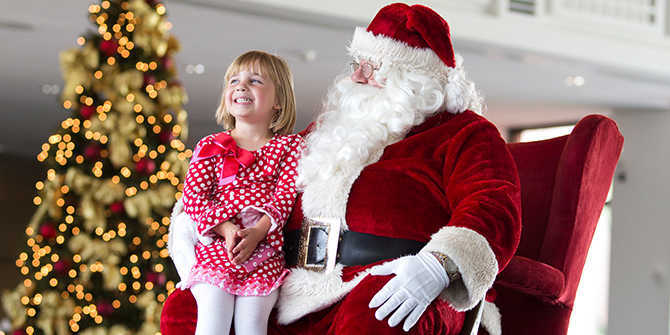 Towne West Square offers photos with Santa daily through Dec. 24 in center court. Special event include Sensitive Santa on Dec. 2, pet photos on Dec. 9 and breakfast with Santa on Dec. 15. Nov. 23-Dec. 16 – visit Santa in his 100-year-old sleigh on weekends during the Prairie Pines Old-Fashioned Christmas. Nov. 23-Dec. 23 - The Polar Express Experiencehappens Fridays, Saturdays and Sundays at O.J. Watson Park. Nov. 30-Dec. 1, Dec. 7-8, Dec. 14-15, Dec. 21-22 - Visiting Santa and his real reindeer is a highlight of A Country Christmas Holiday at Fulton Valley Farms. Nov. 30-Dec. 2 - See Santa during The Arc&apos;s Lights. Dec. 1-23 - Visit Santa at Marietta Farm on Saturdays and Sundays. Dec. 1 & Dec. 15 - Special appearance by Santa after these two shows of “The Runaway Snowman” presented by Wichita Children&apos;s Theatre and Dance Center. Dec. 1 - Take your picture with Santa and Sparky the Elf during the Children’s Christmas Party at the Mid-America All-Indian Center. Dec. 1 - Paint with Santa at Color Me Mine. Dec. 1 - Visit Santa during Christmas in Bel Aire. Dec. 2 - Friends of the Wichita Art Museum Holiday Open House. Dec. 2 - Santa is scheduled to make an appearance at 5 p.m. at the Wichita Boathouse. Free trolleys will transport guests from the Wichita Boathouse to Old Town Square for the Mayor’s Christmas Tree Lighting Ceremony and back to the Wichita Boathouse for Lights on the River. Dec. 2, 9, 16 – Visit Santa in the Square during Holidays in Old Town. Dec. 3-4 & Dec. 17-19 - VIP Santa Visit during Illuminations at Botanica Wichita. Dec. 6 - A Night with Santa at Century II Performing Arts & Convention Center. 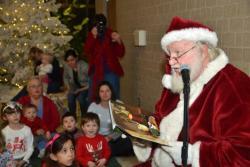 Dec. 7 - Visit Santa at Bringing in the Greensat Great Plains Nature Center. Dec. 7-8, Dec. 14-15 - Old Cowtown Victorian Christmas at Old Cowtown Museum. Dec. 8, Dec. 15 - Breakfast with Santaat Old Cowtown Museum. Dec. 8 -Watch Santa arrive on a Harley-Davidson trike at 1 p.m. at Twister City Harley-Davidson, then get a photo with him while you sit on his red Harley-Davidson. You can also get your photo taken with the Grinch on Dec. 15. Dec. 8 - Santa and more holiday fun during the 2nd Saturday Open House at Generations Antiques & Artisans. Dec. 8 - Visit Santa at the Festival of Trees, a benefit for the Guadalupe Clinic, at Dove Estates Senior Living Community in Goddard. Dec. 8 - Santa is just one of the special guests for Christmas at the Castle Inn Riverside. Dec. 10-13 - Supper with Santa during Illuminations at Botanica Wichita. Dec. 14 - Hometown Christmas at Andover Central Park. Dec. 15 - Meet Santain the main lobby at Exploration Place (no admission required). Dec. 15 - Breakfast with Santa & Dasherat Stearman Field Bar & Grill. For more holiday cheer, view our full holiday event calendar. See our other recent holidays in Wichita blog posts: Best places to see Christmas lights, Family-friendly holiday events, Where to cut your own Christmas tree, Upcoming Holiday Shows, 5 unique DIY Christmas gift ideas in Wichita.